Research bioengineer Shirli Cohen is excited to be teaching free Quest for Space workshops for middle school students. Now Sally Ride Science is helping students do just that in workshops where they can program heat experiments and then actually run their programs in microgravity on the International Space Station (ISS). The Quest for Space workshops are offered through a partnership with Space Tango and the Quest Institute for Quality Education. Shirli Cohen, a research bioengineer who will be teaching some of the workshops, is excited about bringing this unique opportunity to local students. As part of the summer Sally Ride Science Junior Academy, high school students can attend an in-depth 4-week course where they program and run multiple experiments to see how microgravity affects heat transfer by radiation, conduction and convection. Through a program called Library NExT, middle school students can take part in a free 3-hour workshop in library branches around San Diego. Students will program a radiation experiment and upload their programs to the ISS. Library NExT is a partnership of San Diego Public Library and UC San Diego Extension Pre-College Programs. Students in the Quest for Space workshop send their experiment configurations to the ISS and get data back in about a week. The students who took part will get the results of their experiments back from space in about a week, Cohen added, along with a video showing a message they wrote displayed aboard the ISS. Space Tango is a Kentucky-based company that provides a platform for commercial firms and educational institutions to conduct experiments on the ISS. Room on the space station is limited, so Space Tango has created small modules called CubeLabs. These are launched aboard commercial rockets and then plugged in to lab facilities on the space station. In 2018 Space Tango partnered with the San Jose-based Quest Institute for Quality Education, creators of the Quest Space Kit. 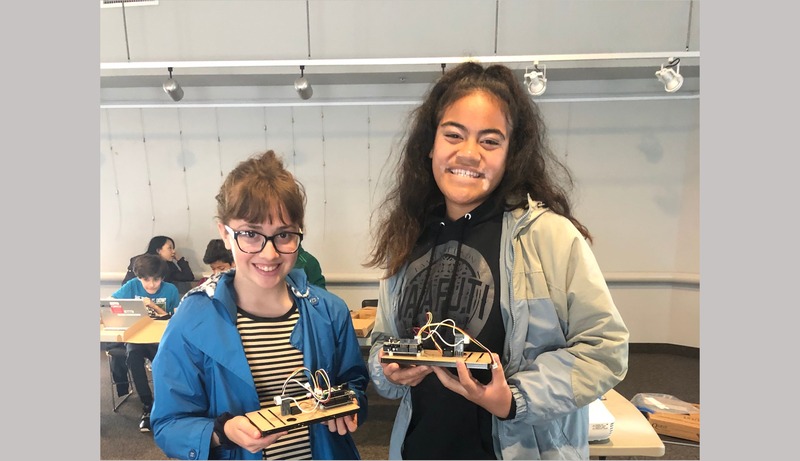 Students use the kit to build and customize hardware for heat experiments, and then program the experiments on the Arduino platform in the C programming language. Finally, students run their experiment configurations in Space Tango’s lab modules on the ISS and analyze the resulting data. The Quest Institute provided special training for Cohen and other Sally Ride Science instructors who will teach the workshops. Cohen, a research associate at the J. Craig Venter Institute in La Jolla, has a degree in bioengineering from UC San Diego. She got interested in conducting experiments in space while working on a NASA-funded project to investigate bacteria that grow in the water system on the ISS. Now she is sharing the excitement with students in the Library NExT workshops. “It’s going to bring new creative, intelligent minds to the field of space research and product development,” she predicted. The Quest for Space partnership continues Sally Ride’s legacy as a champion of science education for girls and boys of all backgrounds. After retiring from NASA, Ride became concerned about the lack of women in science and engineering. She joined with her partner, Tam O’Shaughnessy, and three friends to found Sally Ride Science in order to inspire students in STEM (science, technology, engineering and math). Ride died in 2012, and in 2015, Sally Ride Science became part of UC San Diego under the direction of UC San Diego Extension. Watch a video about Space Tango’s lab modules on the ISS.